Who’s a good doggie? NOT this GRUNGE PUNK PORCUPINE DOG! This dog is a weapon. Coyotes are vicious, omnivorous scamps who do NOT respect the bonds between man and dog. I know this from experience: In 2008, I spent a week on my friend Rosanna’s parents’ farm. They had recently acquired a delightful poodle puppy named Butterball who, frankly, made other dogs look like goofy assholes. Butterball was perfect. When I went back to Rosanna’s parents’ farm in 2009, guess what? Butterball was GONE because she got snatched up by a coyote. It was horrible. RIP Butterball I will probably never forget you. 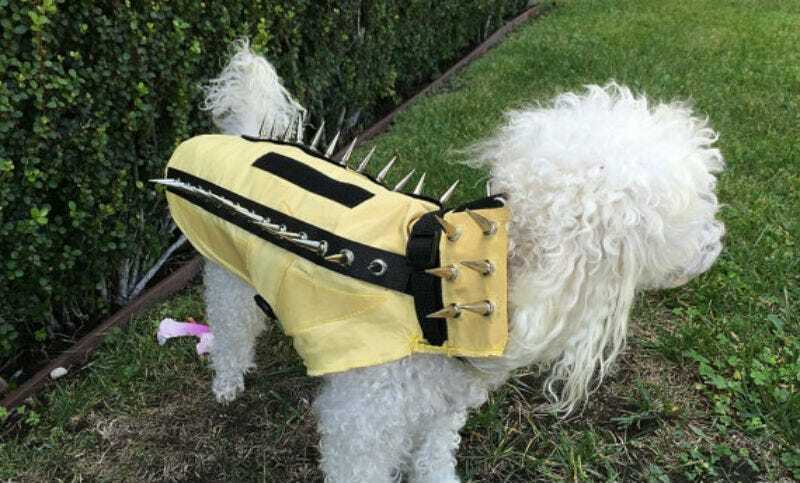 I don’t know if this kevlar-and-spike anti-coyote vest retailing on Etsy for the reasonable price of $60 will actually stop a coyote from eating a dog. Probably not? The head is still fair game. But it couldn’t hurt, and it will make your dog look like it just spent the weekend in a London squat smoking squares and talking about The Slits. Damn the man. Damn the coyotes.